Under Section 36 of the Garda Siochana Act 2005, Joint Policing Committees have been established to provide a forum where Local Authority and senior Garda Officers responsible for the policing of that area, with the participation of Oireachtas members and community interests, can consult, discuss and make recommendations on matters affecting policing of that area. 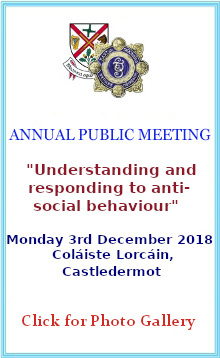 Advise the Local Authority and the Gardai on how best they might perform their functions having regard to the need to do everything feasible to improve the safety and quality of life and to prevent crime, disorder and anti-social behaviour with the area. Arrange and host public meetings concerning matters affecting the policing of the local authority's administrative area. Establish in consultation with the local Garda Superintendent, as the committee considers necessary within specific neighbourhoods of the area, local policing fora to discuss and make recommendations to the committee. The matters to be considered by committees and subcommittees might include traffic, vandalism, anti-social behaviour, underage drinking, casual trading, litter, planning for events attracting large crowds, community based crime prevention initiatives, Garda Divisional and District annual policing plans and Local Authority initiatives.